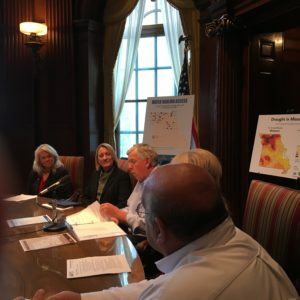 Missouri Governor Mike Parson announced a drought relief plan for the state’s farmers Monday at a news conference at the state capitol in Jefferson City. The plan includes access to public water from which farmers can pump water out and a lottery to harvest hay from state land. Roughly 98% of the state has been impacted by drought. 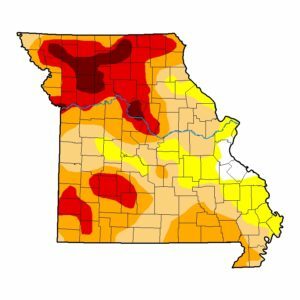 The hardest hit areas experiencing “exceptional drought” are in northwest Missouri along with Howard County in the central portion of the state. Much of the rest of northern Missouri is in the next highest level, “extreme drought” as are portions of 12 counties in the southwest part of the state. 86 counties are currently in a drought alert. Governor Parson issued an executive order creating the “Drought Assessment Committee” in July to examine ways to assist areas that are being impacted. Parson said he’s also traveled the state, holding roundtables in every corner of Missouri to discuss and witness the drought firsthand. The governor, himself a longtime cattle rancher in southwest Missouri’s Bolivar, mentioned he fed hay for the first time ever in the month of August two weeks ago. “Anytime you’re feeding hay in the state of Missouri in August, I guarantee you it’s not a good sign for any farmers in this state, whether you’re a row crop (farmer) or whether you’re a livestock (farmer),” said Parson. He praised three state agencies – the Department of Agriculture, the Department of Natural Resources and the Department of Conservation – for collaborating to find a path to provide relief for farmers. Department of Agriculture Director Chris Chin also commended the agencies for working together and noted the Department of Transportation is helping to ease the burden on farmers by reducing some restrictions and permit fees, so they can haul hay more easily to feed cattle. Department of Natural Resources (DNR) Director Carol Comer added that her agency’s soil and water program has worked with the Soil and Water District Commission to implement programs to provide financing and wave regulations to assist livestock producers in accessing water. She also said DNR’s financial assistance center is offering emergency funding to help local communities provide safe drinking water. Department of Conservation Director Sara Pauley said her agency identified 28 Conservation Areas that have water impoundments which can be used by livestock farmers to pump out water. The various areas are actually a combination of Conservation Areas and Community Lakes in which local managers will issue special use permits to livestock producers. Governor Parson and the agency heads were joined in the news conference by representatives from the Missouri Farm Bureau, Missouri Cattlemen’s Association, Missouri Dairy Industry Alliance, and Missouri Dairy Association. Sean Cornelius with the Missouri Dairy Industry Alliance has a farm near Hamilton northeast of Kansas City, which is part of the area hardest hit by the drought. He was happy to report he received 1.7 inches of rain Sunday night but stated that the total of 3.2 inches since May is very short. Mike Deering, Executive Vice President of the Missouri Cattlemen’s Association, told Missourinet sister network Brownfield that the lottery for access to hay, which will be available on acreage at 16 state parks and historic sites, will leave some farmers without relief. During a historical drought in 2012, then Governor Jay Nixon issued an executive order authorizing the state Soil and Water Districts Commission to implement practices for livestock producers and farmers to drill or deepen wells or expand irrigation systems. The cost-share program did not provide universal assistance to farmers not all of the 11,000 applications for assistance were approved. Greg Buckman, President of the Missouri Cattlemen’s Association, was highly complimentary of the governor and state agencies for providing quick aid for farmers. Agriculture Department Director Chris Chinn also said the federal Natural Resources Conservation Service is also been making some acreage available to Missouri farmers for hay harvesting. 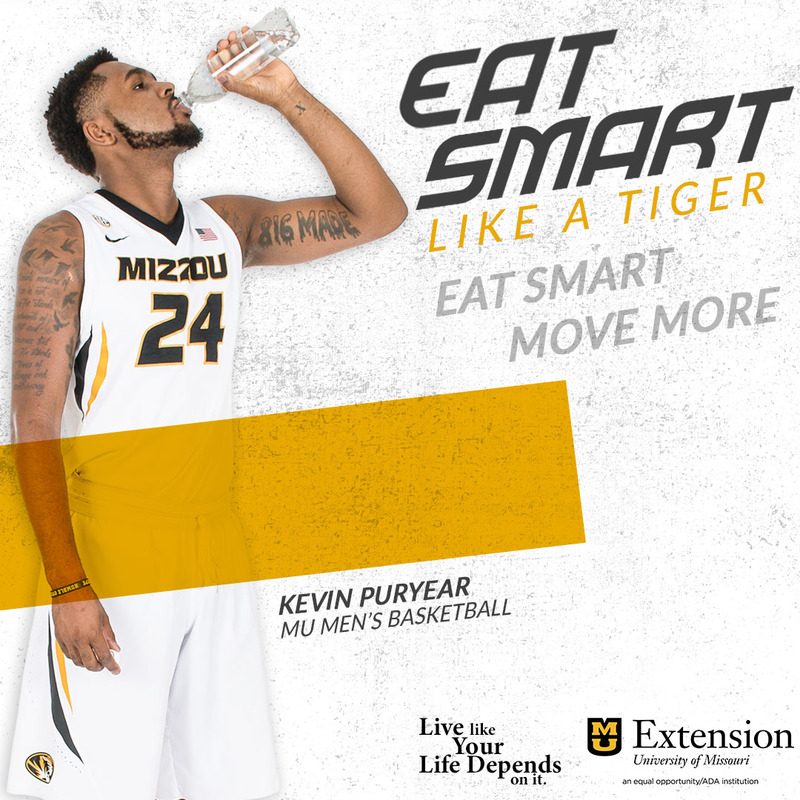 Chinn also clarified that a federal program being sought by Democratic Missouri Congressman Emanual Cleaver for water tower grants won’t help the current drought situation but would provide more water storage in rural areas for future droughts.